Senior Chris Jackman plays a shot. The Wildcats face three opponents this weekend, including two from the Big Ten. 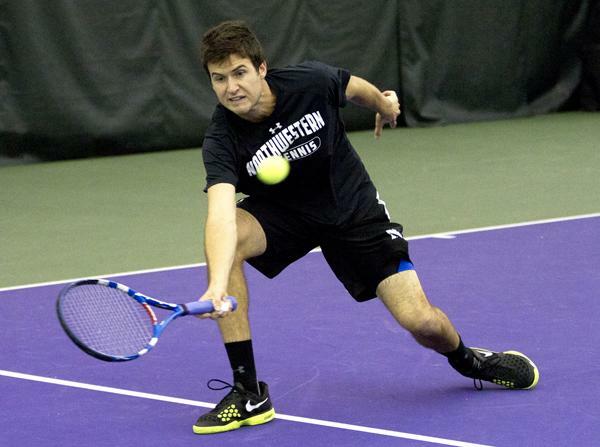 In its first Big Ten match of the season, Northwestern faced off against its in-state rival Illinois, falling 5-2. But the Wildcats gave the Fighting Illini a competitive match and have maintained a positive attitude as they gear up for the rest of the season. For NU, the end result hasn’t always been the telling figure. The Cats have faced a lineup of consistently highly ranked teams and have not allowed their opponents any easy wins. New rankings released Tuesday saw NU climb even higher in the ranks, landing at No. 18 and passing all but two of its Big Ten rivals. While the Cats have been keeping their heads down in regards to their ranking, NU fans have something to get excited about. The last time the Cats broke the top 20 in the rankings was in 1990, when they were led by All-American Todd Martin, who went on to earn a career-high ranking of No. 4 in the world on the ATP World Tour. Wolf said the Cats are working toward building a ranking that would allow them to host during the NCAA tournament, rather than simply qualify, which has been the goal in the past. Three matches at home will keep the Cats busy this weekend as they continue their push through their Big Ten schedule. First up will be Nebraska, which will be competing in its first Big Ten match of the year, followed by a double-header Sunday featuring Iowa and Western Illinois. In its first meeting with Nebraska last season, NU won the match in a tight 4-3 contest against the Cornhuskers in Lincoln, Neb., in which Jackman won the deciding match in a three-set comeback win.